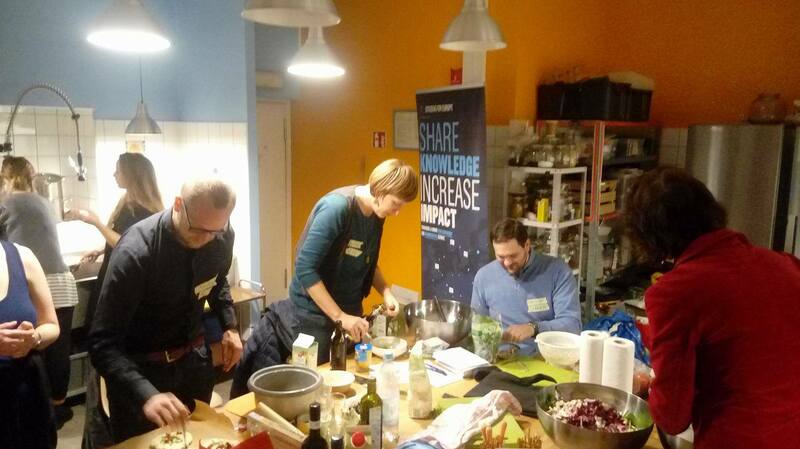 On November 16th, Citizens for Europe invited members of Berlin‘s civil society scene, that share a progressive approach to European topics, to join an after-work kitchen party. We welcomed around 15 participants working in various contexts – as NGO employees and/or volunteers in grassroots groups, in newly founded organisations or with years of experience under their belt. Together, we cooked a 4-dishes meal and sat down to enjoy it, all the while discussing projects and goals, the ways our groups and organisations came together and developed, the plans we make, the needs we have, the partners we hope to find and work with. It was a good night! We will keep working on community building in throughout the next year, and are already planning several follow-up events. And to older, newer and prospective members of Citizens for Europe who joined the party or helped spread the invitation: Thank you!